At the end of Part 58, Allin and Matthias’ plan to escape the merskers was put on hold due to the arrival of a bigger threat: slavers. “That’s your big plan? ‘We wait’?” I whispered to Matthias while watching the oddly-armored invaders begin to round up the merskers. Each of the invading humans had a unique set of armor that was as much a work of found art as anything in the mersker’s village. They were clearly no strangers to life in this trash-filled under-city, but their cars and lights showed that they lived at a much higher level of civilization than the merskers did. I took the first part of his advice, at least, but what ran through my head were questions, not prayers. Out in the center of the village, the slavers were lining up the merskers and putting them in chains. The ones who were already knocked out were piled together like sacks of flour. For all that the slavers had cars and weapons and art, they had no civility, no empathy toward their fellow residents of Earth. It sickened me to see them mistreat the merskers and laugh about it all the while. Meanwhile, the silent army of ghosts remained in place, doing nothing. The slavers gave the ghosts a wide berth but otherwise ignored them. And what was I doing? Hiding in a disgusting stew of rotting carcasses, a potpourri of putrescence that included Guppy. He was just a kid, really, like me. We both made choices, good and bad, that led us to this bin. The difference was, Guppy had no more choices to make and I still did. I could stay in hiding and wait for the slavers to leave. That might be the smart thing to do, the safe thing. Matthias would approve and, disturbingly enough, Dad probably would, too. After all, it fit perfectly with his “Always stay alive” maxim. But outside my safe, stink-filled hiding place, merskers were wailing. The invaders dealt harshly with the few who still struggled against their fate, forgoing the trank guns in favor of beating their recalcitrant captives into submission. I owed the merskers nothing really. Some device of theirs had plucked me from a certain death, as it had for Matthias, but Guppy had not been so lucky. It was chance that saved me, not the merskers. Who knew what they had been planning to do to me if the slavers hadn’t shown up. I certainly hadn’t been free to leave. It would serve them right to get taken away and held captive in return, and it would free me to continue making my way to the roof of the world as best I could, once I ditched Matthias. I looked over at him and saw that he had his eyes closed. The attack on the village was of such little concern to him that he could use this time to rest. I guess I shouldn’t have expected anything else. After all, as one of Doyle’s werewolves, he had probably participated in a scene like this hundreds of times. I felt disgusted. Not with Matthias. With myself. If I did nothing, that would mean one more pocket of life, of light, would be snuffed out in the city. More lights would follow until the Earth became darker and darker and was snuffed out entirely. We might be the last remnants of humanity, but instead of helping one another out, we were killing each other off in a race to extinction. In the end, Dad’s motto wasn’t enough. What good would it be for me to stay alive if the rest of the world died. I had to do more than survive and go sightseeing on the city’s roof. I had to follow Mom’s advice, not Dad’s. With darkness engulfing the world, I had to be a light in the dark. I nudged Matthias and his eyes snapped open. “If I can get you your coil, will you help the merskers? I grimaced and pulled myself out of the muck. Matthias could justify his actions however he liked, so long as he helped. The slavers were loading the unconscious merskers into their trucks. I didn’t have much time. Maybe he recognized my voice, or figured out that a slaver wouldn’t bother to ask him to come out of hiding. Either way, the mersker poked his head out and eyed me warily. I pointed to the center of the village, showing him that the slavers were finishing up loading his tranked kinfolk. The ones who were awake and chained together in lines would be next. The mersker made a tiny moan and turned back to me. His lips trembled and his eyes glistened with moisture. The mersker blinked twice, looked at his friends again, and then crawled back into his hole. Dirt! He’s not getting it. Or he’s too afraid to help. Now what? I could take out one of the slavers if I could get close enough, but then I’d be the next one in chains and loaded into a truck. I needed the coil so that Matthias could wolf out, or the merskers wouldn’t stand a chance. At the end of Part 57, Allin was trying to exit the mersker village so that he could sneak around it and search for Matthias’ coil. The merskers, however, wouldn’t let him leave. Allin hit upon a plan involving the mersker’s weakness: light. I once again casually strolled over to the edge of the village, but this time the suspicious merskers were on to me sooner. That was okay, though, because this time I headed to a different edge, the one where all the ghosts stood watching and waiting. I broke into a sprint and my pursuers did likewise, but I reached the ghosts first. Ignoring their stares—stare all you want, guys, but stay put, all right?—I looked back to see the approaching merskers already squinting against the concentrated ghost light. I smiled and plunged into the mass of ghosts. The cold wiped the smile right off my face. Running through this many ghosts felt like swimming through a frigid pool. I looked back and saw the merskers stop and shield their eyes before giving up the chase. My plan had worked, but by the time I reached the far side of the ghostly crowd, I felt as if all my body heat had been sucked right out of me. I shook violently from the cold, and if that wasn’t enough to make my knees knock together, I noticed that the ghosts had turned as one to face me. This kind of attention I did not need. I hugged myself, rubbed my arms for warmth, and waved a shaky goodbye to the ghosts. “Thanks for the help. Be seeing you,” I said, teeth chattering. If I had expected any of the ghosts to crack a smile, I would have been disappointed. Free from interference, I skulked around the outside of the village. Though the area was hilly with mounds of junk, the ambient ghost light allowed me to navigate. I topped a final hill and reached the back end of the bin I wanted, only to find that my mersker friend was back to work inside it, picking over and examining this and that broken device. He had his back to me but could turn and raise the alarm at any moment. What now? I wondered. Wait for him to go away? That could take time I don’t have. I’m hungry. I’m cold. I’m tired of being pushed around. I’m tired of waiting. I looked around at the trash around me until I saw a metal bar about two feet long. Carefully, I reached over and picked it up. It had a good heft to it but wasn’t too heavy to swing: a nice, makeshift club. That’s when I realized: I was seriously considering braining the mersker in the bin because he stood between me and a chance at freedom. I didn’t owe the merskers anything, to be sure. They were holding me against my will, or had been until I scampered off, and they still had my bag and Matthias’ coil. But could I strike one of them down in cold blood to get what I wanted? I gripped the metal bar tighter, scooted forward a little, oh so quietly, and reached the edge of the bin. I gripped it with my free hand and lifted one leg and then the other over the edge. Now I was sitting on the rear wall and the mersker stood within my reach. I had to decide now, before he moved away or heard me: Do what needs to be done or stay my hand and remain a prisoner? Before I could make up my mind, I heard a gunshot in the distance, followed by the sounds of engines revving. The mersker stopped what he was doing and his head shot up, facing away from me. He listened for a moment as the engine sounds grew louder, and then burrowed into a narrow crack in the pile of electronics and disappeared. Had I really been about to brain him? Did I have the Arcady killer instinct after all? I didn’t have time to ponder those questions. Bright white floodlights lit up the village, sending the merskers into a panic. The sound of the engines cut off, to be replaced by hoots and hollers and more gunshots. Whatever this commotion was, it dashed my already fragile plan to pieces. I needed to get back to Matthias, to decide what to do next. I stepped into the bin and crunched my way down the mound of electronics to the low front wall. Wrecked gadgets and broken machinery poured onto the ground around me as I slid out of the bin and landed on my backside. When I stood up I saw my cocoon bag nestled near the front of the bin, uncovered thanks to the mini-avalanche I had caused. The sight of that old bag did more to warm me up than a raging fire could have. I grabbed it and was about to rush back to Matthias when I thought better of it. I could get caught and have it taken away again, so I stopped first and pulled out two items that I didn’t want to lose. One was my leftover nutri-bulb, which I immediately started to chew on, and the other was the only item I had made in the Skunkworks that could really be considered a weapon. I slipped it into my pants pocket and hoped it would still work in a pinch. That done, I slipped the bag on again and sneaked around the edge of the village, back toward Matthias. I needn’t have worried about being stopped. The merskers had their hands full defending against the invaders. I thought they were werewolves at first but realized that it was actually humans in bizarrely-decorated armor. They had pulled up in vehicles mounted with huge lights and directed them at the merskers, effectively paralyzing the light-sensitive creatures. Some merskers fought blind, inadvertently menacing friend and foe alike, but the invaders made a sport of shooting them down, laughing all the while. I thought of the weapon I had pocketed and felt deflated. At best I could take down one of them with it before they got me. Not good. I managed to stay out of sight by dashing from hut to hut, but when I reached the merskers’ food bin and looked out to where Matthias had been lying in the clearing, he was gone. I looked down at where Matthias’ voice was coming from and saw that he had followed much the same plan as the mersker in the electronics bin. Except Matthias had been closest to the bin full of slimy, rotting fish and animals. Only his head showed above the mass of putrid food-stuff, and if he closed his eyes he could be just another mersker-meal waiting to happen as far as the invaders were concerned. Reluctantly, I squirmed my way in next to Matthias, but not before setting my bag down outside of the bin. No reason to foul that, too. I hadn’t realized that and I wasn’t sure if this made me feel better or worse for the already-downed merskers. I moved into a smaller place recently, which took a lot of my time and energy, so for 11 days I did not write at all, and for a few days before that I only wrote a little. Two weeks without writing, so as you can see from my spreadsheet snapshot, I am far behind my goal. But we’re mostly settled into our new place and I am getting back into my routine of writing before everyone else wakes up and also during my kids’ nap-time. It feels good and I am confident I can get back on track with my goals, although it might take a couple of weeks. While I can be hard on myself, I still allow myself to be amazed that I am writing more now, consistently, than any other time in my life. 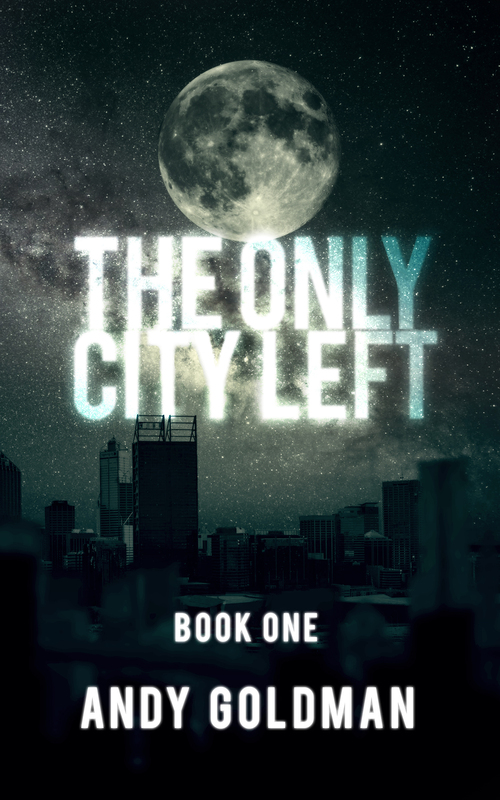 Not to be redundant, but for a quick way to show support for my writing (one click; you don’t need to sign in), please vote for The Only City Left at topwebfiction.com. At the end of Part 56, Matthias was ridiculing Allin’s attempts to communicate with the merskers. Matthias claimed to have a better plan. I looked around at the huts made of junk, which were interspersed with bins full of junk, the whole thing built on a layer of compressed junk and surrounded by hills of the stuff. I had no idea where I would start looking for one tiny lantern coil on a necklace in all of that mess. I told Matthias as much. “I’m sure you’ll figure it out. Now if you’ll excuse me, I tire.” With that, Matthias lay down and closed his eyes. Nice, give me an impossible task and then take a nap. What was I even doing, looking to Matthias for a plan? I walked away from him toward the center of the village. The ghost-light was less vivid here but I still saw the merskers slitting their great, round eyes against the glow and heard them muttering angrily in passing. I felt their pain; there’s not much you can do about ghosts except put up with them or emp them, and the merskers didn’t look to have that level of tech available. Merskers. Bottom feeders, Matthias called them. It looked like whatever trash got flushed out of the upper city ended up here. If there was a roof of the world, I was in its basement now. I was so close! So high up! But as usual, something knocked me back down, sent me to this underworld full of indifferent jailers and accusing ghosts, where the only person who would talk to me would also stab me in the back given half a chance. I missed Tumble. I missed feeling warm and dry and full. I missed the times when it was just me alone, barely scraping by but free to explore the damn maze of a city at my leisure. While I pondered these dismal thoughts, the merskers bustled around setting up stalls and laying out goods. Some monsters, I thought. Merchants, more like it. And if they’re getting ready to sell, traders must be coming soon. I guess time’s running out. I thought to argue about it some more, but couldn’t see the point. We needed each other but couldn’t trust each other. Nothing would change that, so I would just have to do the best I could and watch out for myself. I wandered away from Matthias again, still struck by the difficulty of the task he had assigned me. I had no idea where the coil had been taken or where to start my search for it. I looked back at Matthias and shrugged my shoulders: where to start? He responded with a shooing gesture. Thanks a lot, I thought, but the gesture called to mind my earlier mimed conversation with the mersker. The bin he was working in had my bag and other electronics in it. There was nothing to say the coil would be there, too—it might be in a bin full of jewelry for all I knew—but it was as good a place to start the search as anywhere else. The direct approach had already failed, so I would need to try something else. As casually as I could, I walked toward the edge of the village, thinking to skirt around it and come at the bin from behind. My mersker jailers weren’t that indifferent to my comings and goings, though. One of them shouted when he noticed me nearing the edge of the village. Immediately, four of them were herding me back at spear-point. Not that they understood me or my made-up excuse, but they lowered their weapons and walked away anyway, apparently satisfied that I had gotten the gist of their warning. I had understood all right. If I was going to put my plan into action, I couldn’t make it so easy for them to chase after me. I looked around the village for something I could use to create a diversion, when suddenly I saw the light. I’m still unpacking from our move, and feeling exhausted, so there was no new writing in Book 2 this week. Hopefully I can get back to my routine soon. At the end of Part 55, Allin and Matthias are prisoners in the mersker village, and they discover that the first person to fall into the abyss, Guppy, didn’t survive the fall. I stalked away from Matthias, unwilling to stand there and listen to his nonsense. Guppy’s fall was an accident and it was his bad luck that he hadn’t survived while Matthias and I had. I wasn’t a killer simply because I had defended myself, and I didn’t believe that I had some sort of killer instinct simply because I was related to Doyle. As I turned these dark thoughts over in my mind, the village around me grew brighter. I looked over and saw that the ghosts had caught up to us, a veritable army of them, too many and too transparent to count. They stopped at the border of the mersker village and stood still, watching, waiting. They seemed to be staring right at me, reading my thoughts. Judging me. I walked over and stood face to face with one of them. He didn’t look angry, or sad, or much of anything at all. His face was neutral, but his eyes followed me as I paced back and forth along the line of ghosts. All their eyes followed me. No answer except for an abundance of accusing stares. Still no response. They stood and watched and waited for I knew not what. I couldn’t explain why exactly, but this upset me even more than Matthias’ words. I dismissed them with a wave and walked back into the center of the mersker village. I could feel the weight of their collective gaze on my back, but I shrugged it off. The merskers had emptied their carts in short order and pulled them to one edge of the village. There were maybe a hundred of them, and I watched as they busied themselves with their individual tasks. Although some appeared more masculine or feminine, they were mostly androgynous, clothed in thin rags over their pale, wiry frames. I looked at the large, circular eyes that dominated their faces and I wondered if they were genetically modified like the catfolk or had just adapted to this environment over time. Either way they were a puzzle to me, one I needed to solve if I hoped to get out of their dismal under-realm. I headed over to the large bin where I had seen my bag deposited earlier. The front of the bin was knee-high, but the sides and back towered above me. Inside, a mersker crawled to and fro over mounds of miscellaneous junk. “Hey, buddy, you mind if I look for my bag?” I asked. I lifted away a huge circuit board of some sort, but the mersker immediately scrambled over and knocked it from my hands. He shook his fist at me and yelled something unintelligible. A shaken fist for anger. It wasn’t exactly communication, but it was a start. Now that I had his attention, I tried to keep the conversation going. “I’m looking for my bag,” I said, miming the act of putting a backpack on, taking it off, and looking inside of it. The mersker tilted his head at me and then turned away. I grabbed him by the arm and pulled him around, which elicited a low hiss and a baring of those sharpened teeth. Again, I followed up my words with gestures for eating: hand to mouth, patting my belly. The mersker slipped out of my grip and held onto my arm instead. He jumped down and pulled me along to the bio-mass bin. I saw Guppy inside it and looked away, but the mersker tugged at me to watch him. He let me go, plunged his hand into the bin, and came out with a hunk of torn, scaly flesh. He offered it to me and I took a step back, revulsed. He had no such qualms. He buried his face in it and messily devoured his meal in seconds. And this is where they put Guppy? I thought, horrified. The mersker offered me the scraps, but I waved him off. No thanks. But he was talking to me now, in a way, so I pressed my advantage. I pointed at Guppy and said, “He fell down here.” I wiggled my fingers in a line from above my head down toward the ground. “He didn’t make it.” I slapped my palms together, tilted my head, and stuck out my tongue. “I fell down. He fell down.” I pointed at my chest and at where Matthias lay nearby, and repeated the falling act. “We’re okay.” I flexed my arms and inflated my chest, a picture of health. I had no idea if this was making any sense to the mersker. Maybe I looked foolish, but I didn’t know what else to do. The little guy seemed to get it, though. He pointed at me, mimicked my wiggled-fingers falling gesture with one hand, and dropped that hand into his other palm. Then he then drew both hands close to his body. Next, he pointed at Matthias and repeated the sequence. He pointed at Guppy and started the gestures again, but this time the falling fingers missed his palm, so he mimicked my palm-slapping gesture. “You guys have some sort of device that grabs the falling garbage?” I asked, pulling my outstretched palm in toward my body. The mersker repeated the same gesture, nodded, and grabbed some more food scraps before returning to his bin. “You must be a wonder at parties,” Matthias said. I’m writing this on Friday night before I unplug the Internet access for our house as part of packing. Yes, I am moving, and no, I did not write very much this week. Yes, I am exhausted. Thank you for asking. I may not have Internet again right away, so if you leave a comment, know that I will respond to it once the computer is set up again and the Internet is on. I hope you are having a more relaxing time than me! At the end of Part 54, Allin and Matthias had been captured by the merskers, the things that live in the dark. While being carted toward an unknown destination, the world began to fill with light: ghost light. At the sight of our ethereal entourage, Matthias was impressed despite himself. The number of ghosts drawn into our wake had grown into the dozens if not the hundreds. Matthias nodded at me to go on. He knew all about Doyle’s peculiarities already, I was sure. Matthias made a hrmph sound that meant either “How interesting” or “You’re boring.” I assumed the latter, because he went back to ignoring me. I returned the favor. It was disturbing to be followed by ghosts, but I was happy to have their light. The merskers, on the other hand, sounded perturbed and I noticed the carts start to pick up speed. The ghost light dimmed as we pulled away, and I began to feel cold and alone. I badly needed some human contact. Matthias would have to do. “Why’s Doyle so crazy to get a hold of me?” I asked. I gave up on talking to him after that bit of sarcasm. I could count on Matthias to do what was best for Matthias; I’d have to work around that obstacle as best I could. I lay down again and we spent the rest of the trip in silence. When I felt the cart stop, I sat up and looked around. The merskers had parked their carts in a clearing surrounded by a village of squat huts. The pale creatures set to work unloading their haul, moving with an efficiency that made me believe this was not their first time at this. Looking around in the dim light (for the majority of the ghosts had not caught up to us yet), this was easy to believe. The entire village was constructed out of scrap parts, and between the huts there were great bins into which the merskers sorted the goods they brought back. Past the bins and the huts, hills of garbage ringed the village. They were scavengers, like me, but they had settled down. My sightseeing ended when I noticed a pair of merskers approaching our cart with an intent look on their faces. Despite my protests that I could walk, they yanked on the net and pulled Matthias and me to the ground. Matthias managed to roll onto his good leg but he still let out a roar of pain when he landed. From there, the merskers dragged us in front of a particularly foul-smelling bin full of all sorts of once-living but now-rotting creatures: rats, fish, tentacled sacks of goop, and other carcasses that I couldn’t identify. I did not want to be dumped into that morass of bio-matter, so I started yelling and doing the best I could to dig in my heels. I needn’t have worried, though, because the merskers worked the net off of us and left us in front of the bin before leaving to unload more carts. It was pretty bad, so I reluctantly helped him hobble away from the reek. I half-expected some merskers to run over and force us back to our assigned place, but now that we were in their village, they didn’t seem to care about us. The feeling was mutual until I saw one of the merskers carrying something near and dear to me: my cocoon bag! In all the chaos, I hadn’t given it a thought other than to assume it was forever lost to the abyss. I roughly lowered Matthias to the ground and sprinted toward the mersker holding my bag. A pack of spear-wielding merskers disagreed. I skidded to a halt with a half-dozen sharpened wooden points aimed at my throat, while the mersker with my bag continued on his way to a bin, oblivious to my demands. I held up my hands, palms out, and spoke in a reassuring tone while backing away. I retreated but noted the location of the bin where my bag ended up. I will get it back, you little trolls, I thought as I returned to Matthias’ side. “See something of yours?” Matthias asked. “Well, I see something of mine,” he said, and pointed. I looked and saw two merskers carrying a body toward the pile of dead and rotting bio-mass. It was unmistakably Guppy, his head skewed to a fatal angle. The merskers dumped him unceremoniously on the pile and walked away. “You do nice work,” Matthias said. I had been putting off starting to write Book 2, so last week while I was waiting for the oil to be changed in my car, I used the time stuck at the dealership to just do it already. It was a slow start but it worked. I am off and running, although as you can see from my tracking sheet below, it is in fits and starts because 1) I ended up starting it at a time when I am going to be extremely busy for at least 3 weeks, and 2) after an initial writing sprint, I hit a wall. First, my stats, if you’re interested in that sort of thing. Yes, I like to keep track of my writing day-by-day, to make sure I’m not falling too far behind my goals. Which I am this week and probably for the next few weeks, but at least it gives me something to work toward. What I needed to remind myself after the 27th and 28th is that I am doing this for fun! I let myself be overwhelmed by the imagined importance of the work and that paralyzed me. Let me tell you, Chapter Two as it stands now is pretty awful. But it exists to be edited and I can now move on to Chapter Three secure in the knowledge that Two can be fixed or entirely rewritten later. Having something, anything, to edit is more important than worrying about getting it right the first time, especially if that worry keeps you from writing anything.